I don’t often pick up epic fantasy doorstops like A Game of Thrones by George R.R. 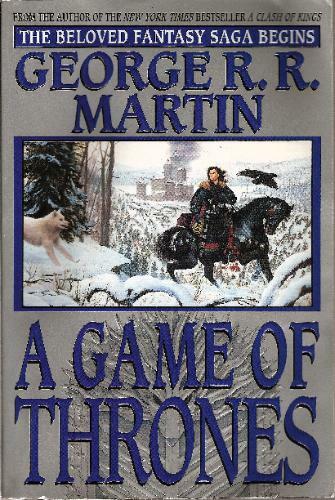 Martin, which is the first novel in a projected seven-volume series called A Song of Fire and Ice. The cover art alone on these things usually looks hopelessly adolescent. And pages of maps and schematics of tangled family trees makes a vein in my neck start to throb. But when you can get it on the Kindle for $3.90, it might be worth a surreptitious look. After all, the first four novels of A Song of Fire and Ice have been translated into 18 languages (thank you Wikipedia) and an HBO television series is currently in production. Not bad. Who would expect such concision in a hulking book like this? Martin never comes close to reaching the poetic heights of Mervyn Peake in Gormenghast (who does? ), but there were times I thought his ear for English was so finely tuned, and his flair for Age of Chivalry-type phrasings so apt, that he must certainly hail from the land of King Arthur himself. His actual place of birth? New Jersey. Oy. That A Song of Fire and Ice has been dubbed “the Sopranos in Middle Earth” is purely coincidental, I am sure. A Game of Thrones is an engaging enough hero’s journey that will provide hours of enjoyment (think also, “Diana Gabaldon for guys”) but be warned: it is long. There are more characters in it than you can waggle a piece of Valerian steel at. And if you can’t stand the thought of all the trees being sacrificed to produce nearly cube-shaped paperbacks like these, you can always read it on the Kindle. Or wait for the HBO series on TV.